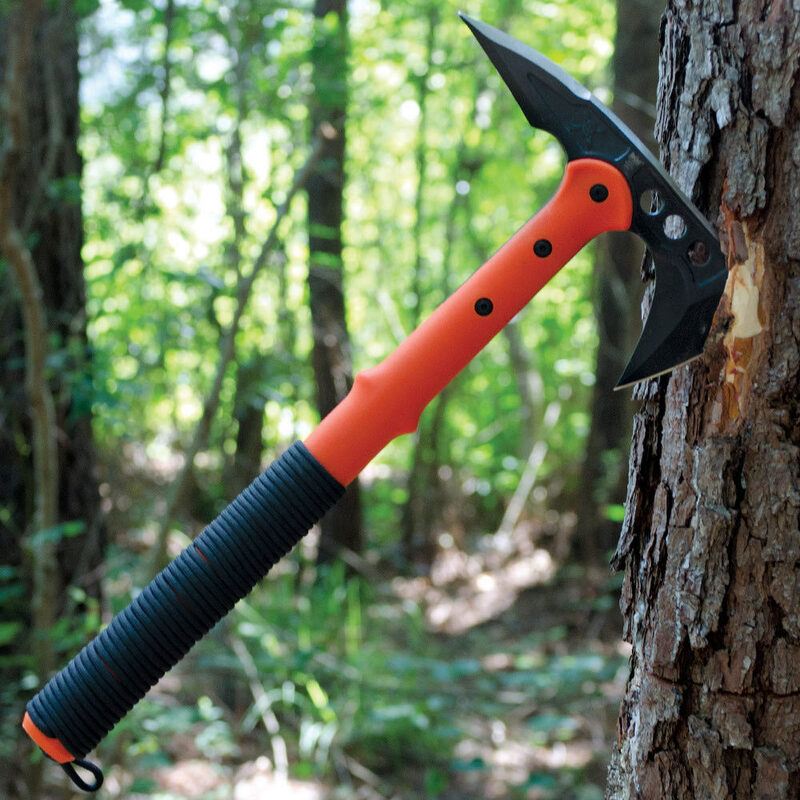 Survival Rescue edition of our Advanced Combat Tactical Tomahawk, with bright orange handle and cord wrapping. The secondary edge on the backside of the head is specially sharpened on both sides for a cutting and hooking attack. 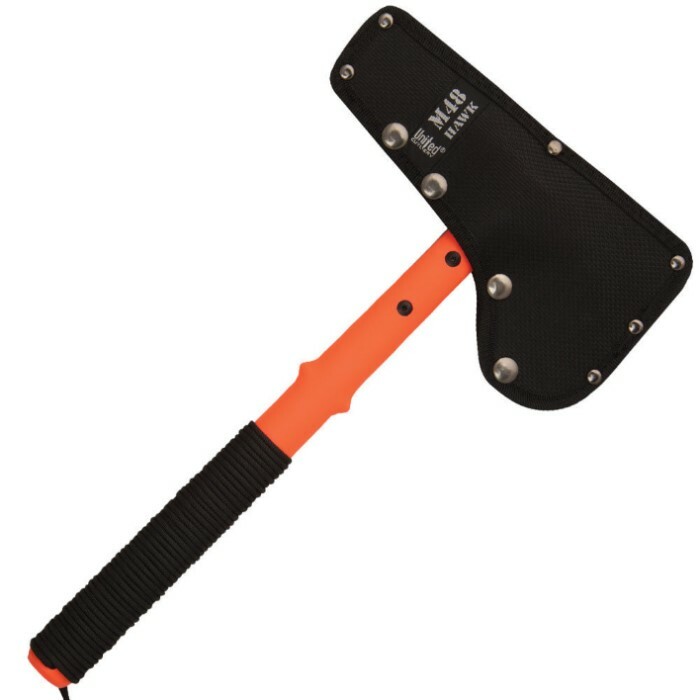 When combined, the spike and axe head make for an efficient personal defense and breaching tool. Got this on a promotion with free M48 fingerless gloves. I didn't care much for the bright orange color, at first. But it shouldn't get lost around camp, when I'm ready to leave. Seems reasonably sturdy; though I don't plan to throw it or fall trees with it. All in all, I'm pleased with this purchase. For a b1g1 you can't go wrong here. Just tested the tomahawk on the tree out back. Had to rewrap the handle after 5 throws, but the blade was barely affected by the tree though it was not very sharp by my standards to begin with. It has good throwing balance with about 1" penetration with a relatively soft throw at a good hardwood tree. great buy for the price, glad i bought the packaged deal though. cost me half of what it is now. How could you even get along without this one.. A fully functional tactical tomahwak that delivers as advetised. Perfect balance and a bright orange handle that says look at this, to any opponent. And the price is right, arrived razor sharp and ready for anything the world can throw at you... Once again trueswords delivered... With flying colors. Ask me again why I shop here? Bought two of these both broke when I threw them JUNK!!! Here's the truth about this weapon...I used this T-Hawk for throwing, light wood-work, clearing debris, camping, and many more activities that involved long-term degradation. It survived approximately 18 months until it snapped around the middle bolt. I would prefer to have it last A LOT longer, but for the beating I put this through I felt that I got my moneys worth. In the end I turned it into a powerful throwing "star" which I managed to gain at least 75% accuracy from my regular 40% with the handle. Therefore it deserves AT LEAST a 4 for being an overall [email protected]$$ weapon. Solid balanced feel, can't find a better tactical tom for the money. Great piece of equipment to have,very nice weight,but the only bad thing is that its suppose to be orange but its really light pink about the color of salmon. Awsome hawk amazing at cut soft and hard wood. Prity nice thrower to just the crod around the handle fell of but that's the only bad thing. MUST BUY.